Also, See in Her Message Below, link to 15-minute YouTube video sample of the music. Precious Hearts, I would like to share with you information about a sacred and wondrous musical gift that is being given to Humanity. The Divine Intent of this gift is to assist each of us through the physical challenges we are experiencing as we move through this auspicious time. Please read these words with an open heart and an open mind. We have been longing for the time when Heaven and Earth would come together to assist us in our endeavors to transform ourselves and this planet. This is that moment. I would like to share a little background about this musical gift. 2011 began with an incredible influx of Light. On December 21, 2010, we experienced the Solstice and a very powerful Full Moon Lunar Eclipse. The synchronicity of these two events occurring at the same time had happened only one other time in the past 2,000 years. On Christmas Day, in the midst of that incredibly powerful influx of Light, our beloved son Joao got sick. On December 29, 2010, he passed away from complications with pneumonia. Joao was 42 years old. He left behind his wife and three beautiful sons. Since his transition, Joao has shared with his Father and me that his time on Earth was complete. He said that he was able to move directly into the Light and that he is now working with Archangel Michael and the Legions of Healing. He said that he will be able to “Gift” Humanity in our service to the Light in ways that he could not accomplish from the physical plane. When Frederic Delarue, a wonderful French musician, received my e-mail announcing our son's transition into the Light, he said he felt very connect to Joao's soul. Frederic said that he knew Joao was trying to connect to with him and that he needed to be at Joao's Celebration of Life ceremony, which took place on January 8, 2011, in Tucson, Arizona. Once Frederic made the heart commitment to attend the service in Tucson, Joao began communicating with him. Joao asked Frederic if he would accept the responsibility of receiving a musical transmission that would be a legacy for his family. Frederic agreed to Joao's request without knowing any of the specifics about the music. 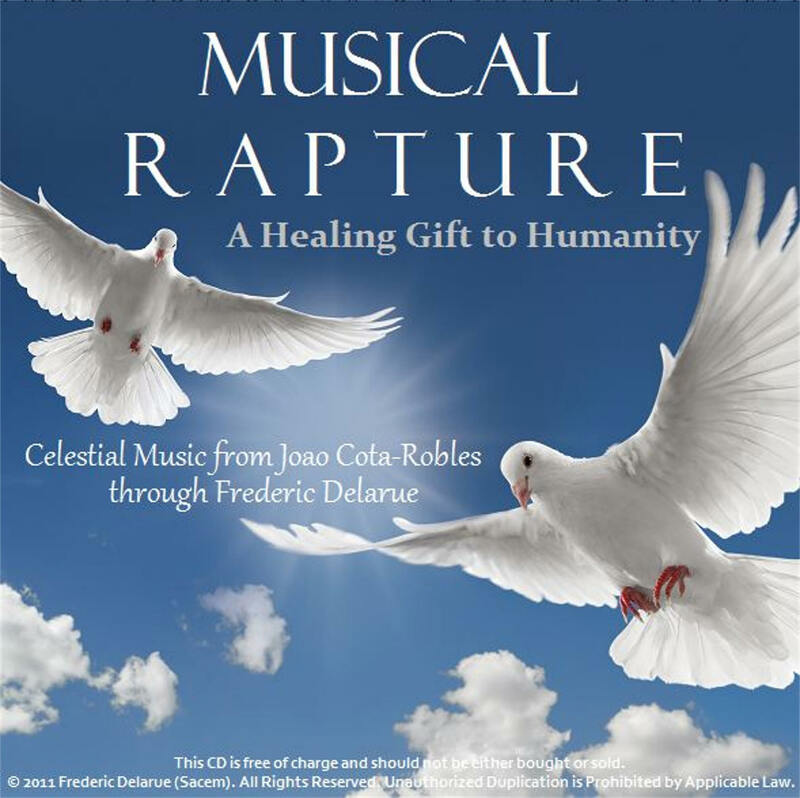 After Frederic returned from Joao's Celebration of Life ceremony, Joao began to reveal to Frederic just what this music would be, a Healing Gift for Humanity. For the next few months after Joao's transition, Frederic said that Joao would come to him and tell him some things about the music and how it was to be distributed. Then, just before Easter, Frederic awoke with a powerful heart prompting to go to France immediately, so he made arrangements and flew to France. During the month of May while he was in France, he went to Rennes-le-Chateau on several occasions. Rennes-le-Chateau is a sacred focus of Mary Magdalene, who is at this time working with Mother Mary and all of the Feminine Aspects of our Father-Mother God to bring to the consciousness of the world the return of the Divine Feminine, our Mother God, or as we have often referred to this Aspect of Deity, the Holy Spirit. Frederic said that when he sat in the church and contemplated the Presence of Mary Magdalene, he had a miraculous experience that transformed his life. He returned home a different person. He knew that his experience with Mary Magdalene was a necessary factor in preparing him to receive Joao’s gift of healing music for Humanity. During the month of May, while this initiation was occurring for Frederic in France, Mother Mary was assisting every one of us in a miraculous way. Over 40 years ago Mother Mary told us that prior to Humanity’s embodiment this time she had made a covenant with every man, woman, and child on Earth. She said that in the not too distant future, when Humanity was open and receptive to the influx of Divine Love from our Mother God, the Holy Spirit, she would draw us into her Temple of the Immaculate Heart and assist our I AM Presence to expand the Threefold Flame in our heart to its original size. She said that this would greatly enhance our ability to receive and assimilate the frequencies of Divine Love from our Mother God and the 5th-Dimensional Realms of God's Infinite Perfection. This May as we each slept at night, our I AM Presence escorted us into Beloved Mother Mary’s Temple of the Immaculate Heart in the Inner Planes. Within her focus of Light, Mother Mary helped our I AM Presence to expand the Threefold Flame in our heart to its original intensity. This is the fulfillment of the covenant Mother Mary made with each one of us prior to this embodiment. On June 10th, Frederic sent me an e-mail and said that he wanted to talk to me about Joao’s music. I did not know anything about Frederic’s trip to France and he did not know anything about the gift that Mother Mary was giving to Humanity during the month of May. We talked about those things and he said that since he returned from France, Joao would not leave him alone about the music. He said Joao seemed to feel that there was now an urgency to make this music available to the world. Frederic asked me to ask Joao about the music to be sure that the message he was receiving was correct. The next morning Frederic e-mailed me and said, “This is the day.” It was Pentecost. Frederic said that early that morning Dr. Florence Phillips, who was the only Minister to allow him to do his work with the Angelic Music of the Spheres without conditions, passed away from cancer after being in a deep coma. Right after I received the e-mail from Frederic Joao's Dad called me into the kitchen to see a magnificent White Dove that had flown into our garden. We have lived in our home for 45 years and we have never seen a White Dove in our garden. Frederic prepared his equipment and turned everything on so that he would be ready. When the time was right, Mary Magdalene expanded her luminous Presence and held Frederic and Joao in the embrace of her radiant Light as Joao played his healing music through Frederic’s hands. Joao said this music is encoded with frequencies of healing that Humanity has not been able to reach until now. This is being made possible because of the expansion of Humanity’s Threefold Flame, the return of our Mother God, and her monumental influx of Transfiguring Divine Love. He said for Frederic and me to make the highest possible resolution of the music available to Humanity. Otherwise, some of the new healing tones might be missed. To protect the integrity of this Celestial Music, it has been copyrighted in Frederic Delarue's name and all rights are reserved. The music is never to be bought or sold. We have also produced a 15-minute YouTube video of the music, so you can see what a sample of it sounds like and you can let the members of your family and friends who you feel may be interested in this Healing Gift for Humanity know about the music. If this link does not work, please copy it and paste it into your browser. It is not by chance that this Gift of Healing Music is being given to Humanity at this time. Remember, we are in the midst of one of the most powerful influxes of Light we have ever experienced. This summer the Company of Heaven is standing in readiness awaiting the invitation to intervene in our lives. Powerful celestial alignments are occurring that will help us release and let go of the behavior patterns that have kept us stuck in our dysfunctional human miscreations. This is an incredibly powerful and sacred time. This month we will experience three eclipses and the June Solstice, all of which will provide unique opportunities for Humanity to add to the Light of the world as we pave the way for the unprecedented influx of Divine Love that will be secured in the physical plane through every person's Heart Flame, in August 13-18, 2011. For details about this event you can go to my website and click on the box that says 25th Annual World Congress on Illumination. Each of these alignments will build on the previous influx of Light which will catapult the Earth and ALL her Life further up the Spiral of Evolution. This will move us a quantum leap toward our ultimate goal of Ascension into the 5th-Dimensional frequencies of Divine Love and Unity Consciousness. August 13-18, 2011 - Securing Humanity's newly created Planetary CAUSE of Divine Love in the physical plane of Earth through every person's newly expanded Heart Flame.